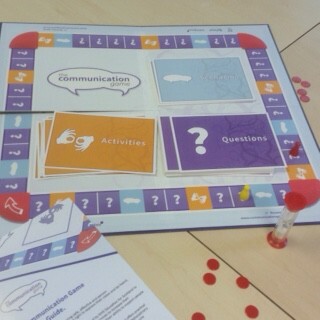 Delighted to introduce you to ‘The Communication Game’ : a board game for staff to improve their communication skills. How we listen, talk and engage with people is fundamental to the quality and effectiveness of health and social care services. Although communication underpins everything we do in a work context, it can be a difficult topic for staff to talk easily about. Add to that the possibility of service users having an additional communication support need, through reasons like stroke, learning disability or dementia, then there is much potential for things to go awry and unfortunately, they often do. ‘Poor communication’ is cited as the most common cause of frustration in complaints about services. 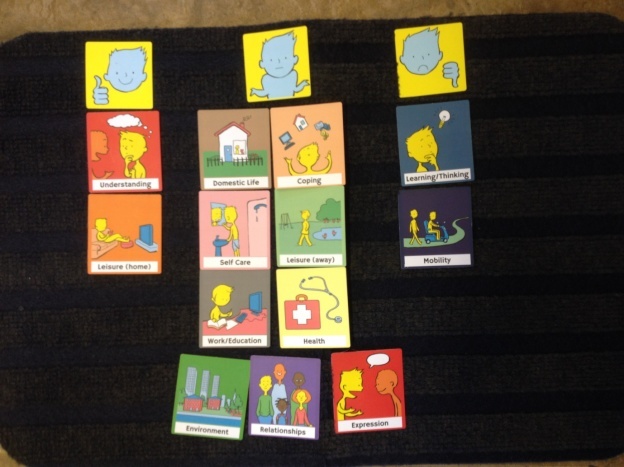 The Communication Game was developed by Focus Games, NHS Education for Scotland (NES) and Talking Mats. It is a learning tool to help staff working in the health & social care sector increase their knowledge and skills around communication. The Communication Game is fun and easy to play. It can be played with or without a facilitator, and allows staff groups to have discussions and reflect on their communication skills. It allows them the chance to learn from each other. It will improve knowledge, but more importantly enable them to think about the small steps they can make to improve their interactions. The project grew out of two previous projects funded by NES: Making Communication Even Better and Through a Different Door. In these projects, it was recognised that the experience of services for people with a communication support need is something of a lottery. For them, there was a considerable difference in the experience of interacting with a staff member who was empathetic and able adapt to their communication, to interacting with a member of staff who was struggling and unable to adapt their interaction. Training and understanding of inclusive communication practice is key. It has been a great privilege for Talking Mats to continue to support the work of the previous 2 projects and work with Focus Games Ltd to develop The Communication Game. Support during the development process from the Stroke Association Scotland, Capability Scotland, RCSLT, Scottish Care, Communication Forum, Queen Margaret University and NHS Ayrshire & Arran SLT Department have been invaluable, and we are very grateful; also to NHS Education for Scotland for their continued input and funding. If you are working with staff in the health and social care sector, then this will be a great resource for you. You can get The Communication Game from the Focus Games online shop. It is guaranteed to promote laughter learning, and a touch of competitive team spirit. Most importantly, it will be a catalyst to help develop staff communication, making interactions better for people with communication support needs. , and follow the game on Twitter on @Comm_Game. Get your copy at www.focusgames.com. This entry was posted in AAC, Aphasia, Autism, Communication difficulties, Dementia, Learning disability, Multiple Sclerosis, Participation, Personalisation and tagged AAC, Communication difficulties, Dementia, Learning Disability, Talking Mats, Training on September 5, 2016 by Lois Cameron. Where is the best place to start using the Talking Mats health and well-being resource? This entry was posted in Aphasia, App, Blog, Capacity, Communication difficulties, Dementia, Digital Talking Mats, dysphagia, Eating and drinking, ICF, Learning disability, Multiple Sclerosis, Occupational therapy and tagged capacity, Communication difficulties, Dementia, digital, Dysphagia, Eating and Drinking, goal setting, Learning Disability, Participation, stroke, Talking Mats on March 10, 2016 by Lois Cameron. Social workers are required to complete a detailed assessment of their client’s needs. It is recognised that it can be a challenge to ensure clients fully participate in the process if they have cognitive or communication difficulties. The City of Edinburgh Council were keen to explore if we could adapt their standardized assessment tool and make it into a Talking Mat framework. Several staff in the council are already skilled practitioners in Talking Mats so are familiar with the framework and use Talking Mats in their practice. They are enthusiastic about the benefits of using Talking Mats both in terms of how it increases participation of service users but also because in their view it makes interviews easier for staff to undertake. In order to develop the bespoke Talking Mat we held a seminar to discuss the social work assessment tool and approach used. Six key staff attended the seminar, facilitated by two Talking Mats associates. The discussion at the seminar identified a structure that would enable us to construct a coherent visual conversation that would cover the issues required to complete the assessment, using mind mapping to support this process. It is also important to identify a top scale that matches the question you are asking and make sure the options you are including are neutral and not leading. Nicki Ewing from Edinburgh City Council who leads on the project says ‘ I am very excited that staff have a tool that can make assessment more meaningful for service users to participate in and makes it easier for staff to get good quality information’. We are thinking of holding a focus group for others that might be interested in using the framework for their practice if, you are interested please contact Lois via the info@talkingmats.com email – call your email ‘social work focus group’. This entry was posted in Aphasia, Blog, Communication difficulties, Dementia, Learning disability, Multiple Sclerosis, Participation, Personalisation, Self directed care and tagged capacity, Communication difficulties, Dementia, Learning Disability, Participation, Personalisation, Self directed care, Talking Mats on June 26, 2015 by Joan Murphy. How do health service staff support people with communication disability? It is recognised that it is difficult for people with communication disability to give feedback to health service staff. The group that developed the Making communication even better resource decided that mystery shopping would be a good way to find out whether health staff were supporting their communication and enabling them to access the services that they require and are entitled to. Funding was sought and gained from NHS Education Scotland for a small mystery shopping project. This entry was posted in AAC, Aphasia, Communication difficulties, Dementia, Learning disability, Multiple Sclerosis, Participation, Personalisation and tagged AAC, Communication difficulties, Participation, Personalisation, stroke on December 12, 2014 by Lois Cameron.